The notebook project-you buy one, we give one! 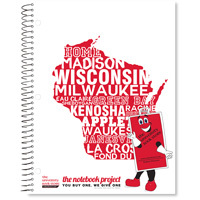 For every notebook project notebook we sell, we will donate a 70-page notebook to a Wisconsin student in need. The fun Wisconsin graphic is on a 11″ X 8.5″ notebook with 70 sheets of college ruled paper. 120 sheets of white paper in a 2 subject notebook format that measures 11″ X 8.5″. Colors shown are examples, and will be picked at random. I understand the bookstore will pick notebook colors at random. 500 sheets of multi-use copy paper measures 8.5″ X 11″. 92 bright white, 20# basis perfect for any printer or copier.